I’ve been in this great industry just about eleven years now. During that time I’ve received endless advice from my different sponsors, upline, coaches and through the books I’ve read. Some of the advice was good and some of it was outdated. However, the best MLM training advice I ever received was to develop multiple streams of income in my network marketing business. During my first six years in the industry, I focused exclusively on growing my MLM business. I worked with several different MLM companies during that time to include Amway, Life Force International and Melaleuca. All of those companies were good companies. I enjoyed the products and services, and achieved moderate success, but never really learned how to create multiple streams of income. In all three companies, my sponsor and upline taught me to make a list of everyone I know and share the business opportunity with them. They taught me to focus on sponsoring business builders. They taught me that everyone was a prospect and that using “old school” techniques were the only way to succeed. Looking back, I was a fool for following their advice blindly. It took me a long time to come to the conclusion that most people weren’t interested in my products or services. And even less people were interested in learning more about my business opportunity. I had it all wrong. I didn’t have a way to make money off people who said no to my business opportunity. I didn’t have a funded proposal. I didn’t have a system that generated leads and then sifted and sorted through my leads for me. And I wasn’t even focused on my target market. I was spending all my time and money trying to recruit people into a MLM business who didn’t want to join a MLM business. Can you believe that? I was an idiot. Several years ago, I read the book “Multiple Streams of Income” by Robert Allen. That book changed my life. It taught me that relying on one income stream is foolish and that the ultra-successful and ultra-rich had several different income streams from several different sources. 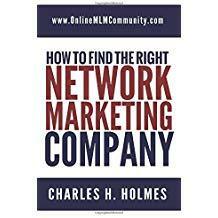 I applied what I learned in the book to my network marketing business and haven’t looked back since. Combine that with what I read in “Magnetic Sponsoring” and I had a formula for success. Now, I have no pressure about whether or not people join my business opportunity. In fact, I make money even if my prospects DON’T join my business opportunity. I have a leads, training, system and affiliate business that pays me very well. In fact, I have about 15 really solid income streams in my network marketing business. When you add up these income streams each month, it is a really nice income. More importantly, I use my blog and website as my hub of operations and I focus on building my email list. That is always my # 1 goal: build a list. All of my marketing efforts are based on getting people to subscribe to my list and then I follow up with them via email to share the different products and services I promote. I hope you will take this advice to heart. Build a You, INC business where you have multiple streams of income, with your MLM Business as just one of those income streams. Do that and you will position yourself for long-term success and long-term money in our industry. Don’t do that and you are setting yourself up for failure and disappointment. What are your thoughts? What is the best MLM Training Advice you ever received? Leave a comment and let us know. Some more great advice Chuck. As I have said before, don’t put all the eggs in one basket. By creating multiple streams, you are giving yourself peace of mind. It will help you live stress free. I commend you on giving such great and timely information.